When it broke I smell some "electric smell". The kind you usually smell when electronics break. I opened up the blender and have taken the rotor out, as I suspect the problem might be in the rotor coils. My question is I have no idea how electric rotor coils are supposed to be wired. How can I use my multimeter and test if the coils are shorted, connected, or otherwise in proper order or not? For example if I measure the resistance between two adjecent copper "pads" (the pads that the brushes touch), the resistance is zero. Is that normal? Half of the pads on one side of a the pad circle seem connected to each other. And half on the other side. Except one pad that doesn't seem to be connected anywhere. So something is clearly not right, but I'm not sure what. Should adjecent pads be connected to each other or not? After a couple of weeks waiting for the replacement rotor it finally arrived and I measured it for comparison. The rotor contact points are all connected to each other. Each one is connected to each other with increasing resistance the farther you move from adjacent contacts. Not sure if this is a special case with this rotor. But that is what I measured. I put in the new rotor and assembled everything. Now works as good as new. So the original rotor was clearly the faulty component (as measured with the multimeter also - not all contacts were connected any more). Rotor brushes are on opposite sides so, look for something ~< 1 Ω on armature contacts in pairs from opposite sides , and continue all around. Also check the stator windings from the main plug in the ON position or some other convenient method. Then look under the switch panel for a triac and fixed resistors and look for evidence of burn marks. Is this a design question? Not the answer you're looking for? Browse other questions tagged motor multimeter or ask your own question. Fuse blowing in 12 multimeters rated for 200mA, only measuring 12.5mA. Why? why does my voltage regulator produce 5.11 volts instead of 5? 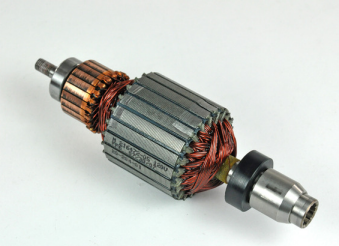 DC motor won't run - how to increase strength of coils? Multimeter shows OL or 0.00 or 1.00. What's wrong?